I've always been interested in music, and playing some kind of instrument has almost always been somewhere near the top of my list. The first one I can remember is a little uke. 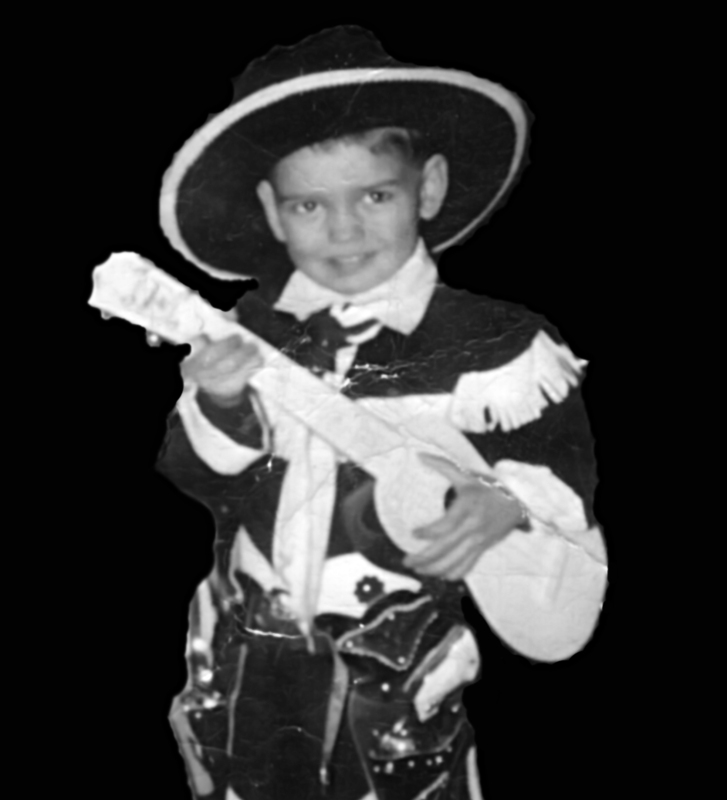 Below, and to the right is a photo with me all decked out in a cowboy outfit, holding that little 4-string beauty. Next was a steel guitar which I was learning while living in Houston Texas. I switched over to electric 6-string while I was in high school. I think my first guitar came out of a Sears catalog. Then, I started playing in rock groups just out of high school. If I remember correctly, the first group was the "We Who Are". We had the typical lead, rhythm, bass and drums. We also had a fantastic sax player named Freddy Belch. I wonder where he is. The next group was the Ice Cream Social. This was a cool group! Come to think of it, I believe we patterned ourselves after "Luvin' Spoonful". We even had an autoharp player! We played at various college town hangouts, including the famous(?) Ratskeller in Oberlin Ohio. I had graduated to the Gretch Tennessean by this time, and was experiencing what turned out to be the height of my young career. Not long after this point, I got married to Sandy, and I'm still with the same great girl after a whole bunch of years. I wouldn't have it any other way. My playing, or at least performing was put on hold for a long time while we raised a family, but the music didn't die. It was in 1976 that I decided to trade in the Gretch for the Guild D55 NT that I have today. Over the next several years, I got involved in all kinds of music, including bluegrass. I bought a Fender Leo 5-string banjo, and had a ball playing it. In fact, I taught bluegrass banjo, and finger style guitar for a couple of years at a local music store called Ron Zehel Guitar Land in Amherst Ohio. I even tried my hand at the fiddle and mandolin. I've continued with the flat top over the years, and that forms the basis for the endeavor I'm involved in now. Getting back on the "road" has been a blast, and I'll continue doing it as long as they'll have me. I've even begun introducing some songs I wrote back in the early to mid 80s. I continue to write music now, several years into the rebirth of my music "career". At this point, I've released 6 albums, and I'm working on the 7th. There are at least 3 or 4 left in me. We'll see. The way I see it is this, I may have gotten a late start, but it's a heck of a way to wind down.